With a large, diverse and ultimately comprehensive collection of products available, BS Stainless is one of the UK's leading independent producers of stainless steel precision strip coil. Whatever metal grade, surface finish, type or size you require, BS Stainless can quickly supply it and, as with our entire product portfolio, you're guaranteed 100% professional quality at a competitive market price. When precise tolerances are vital, stainless steel strip coil from BS Stainless is the professional's choice. Applications for this versatile material are many and include the manufacture of heating elements, filtration devices, flexible tubing, heat exchangers, springs, cutlery and a range of medical and surgical instruments. All of our precision slit stainless steel strip coil is produced right here in the UK, using our array of state-of-the-art slitting lines. The material, which is supplied throughout the UK and Europe, is manufactured within the scope of our ISO 9001 2015 accre­dita­tion, ensuring the most consistent quality. Our flexibility and experience allows us to produce coil to any individual specifi­cation, including coil with deburred edges for safe handling, lightweight coils for easy lifting and painted coils to conform to a colour-coding system or simply to improve aesthetic appearance. Once manufactured, precision slit stainless steel coil from BS Stainless is packed to customer specification and we use ISPM 15-compliant timber pallets. 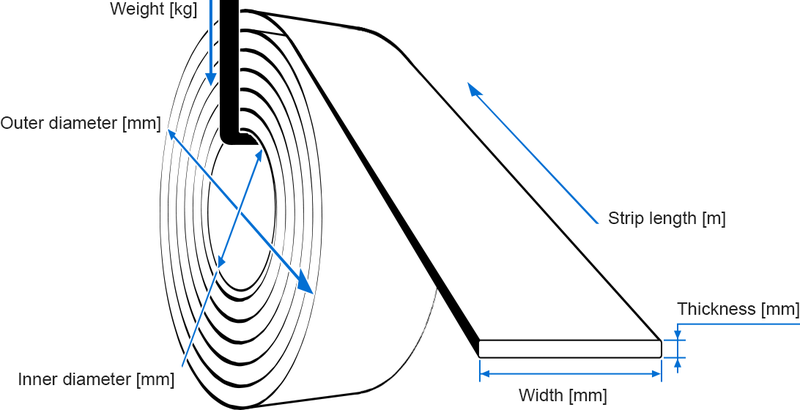 To calculate the OD (Outside Diameter) of a coil or length of coil, use the free coil calculator available on our website. If you have any further questions or need advice using this or any BS Stainless product, simply get in touch with our skilled technical team who will be happy to help.